My Warcraft journey continues as I randomly picked the book that has both a troll and a panda on the cover with flames shooting out behind them! Luckily, the novel is great fantasy that is mostly accessible to just about any adult reader. 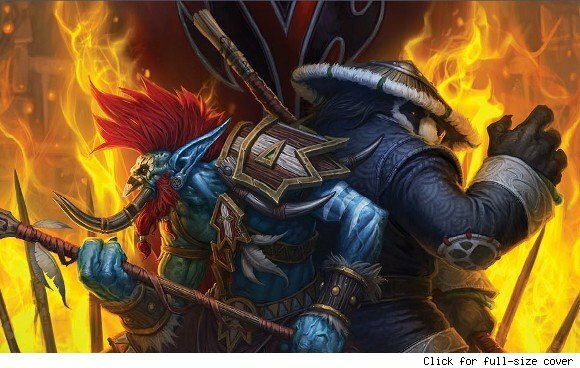 The legendary Darkspear troll, Vol’Jin, is almost assassinated by the warchief Garrosh, but fate leaves him in the care of the Pandaren, a peaceful panda race living in the mists of the lush island of Pandaria. There, Vol’Jin meets Tyrathan Khort, a human who is also recovering from wounds. In addition to adjusting to the pandas’ monkish lifestyles, both troll and human must learn to accept each other as they heal and get back to their fighting ways. The charm of Shadows of the Horde, written by New York Times bestselling novelist Michael A. Stackpole, lies in its dedication to developing deep characters. The reader watches the two main protagonists grow as they reckon with the deeds they committed in their life before Pandaria. Readers will also delight in getting to read about famous WOW panda Chen Stormstout, a sincere character who is friendly and kind without going full on “Po” from Kung Fu Panda, allowing for levity without silliness. Adding to the main characters’ internal strife, the ancient troll tribe, the Zandalari, make a play to take over the Pandaria. Will troll and human unite and go back to their violent ways to save Pandaria? Even with knowledge of martial arts, can the Pandaren hope to stand a chance against a giant horde of bloodthirsty trolls? While it can take a while to get there, such is the hook of this engaging novel. The novel does drag at times, and the narrative is a bit convoluted and confusing. Often, I was able to quickly figure out who the novel was referring to and what was happening, but I suppose such is the drawback of reading a novel that takes place in such a vast universe. Lastly, for as much buildup as there is to the stirring conclusion, it’s not completely satisfying. In some ways, it feels a little too neat, but the upshot is that it allows the novel to circle back around to focusing on the importance of the well written characters. Any fan of WOW should read this. Any fan of good fantasy should also give this book a try as I’ve found the Warcraft novels to be more than fluffy video game tie-ins. They’re written by good authors in their genre and thus far have yet to disappoint as I venture through this brilliant fantasy world.